DEAR JERRY: I have searched every way I know of for a song from the '60s, by a male vocalist. What I do remember is twice, during breaks in the music, that he says "Peaches." Can you identify this apparently obscure record from just one meager clue? DEAR THOM: Fortunately, I know of only one "Peaches" that matches your meager clue, so I think we can close this basket, er, case. 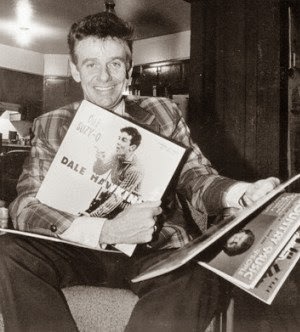 The artist is Dale Hawkins, best known for the 1950s rock classics, "Susie-Q" and "La-Do-Dada" on the legendary Checker label. A few years later (1962) he made one record for the not-so-legendary Zonk Records Inc. This disc coupled "Peaches" with "Gotta Dance" (Zonk 1002), both Hawkins originals. Predominantly a guitar-driven instrumental, there are indeed two times when the music pauses and Dale says (not sings) "Peaches come from Georgia … gonna get me some." However, it is the demand for the otherwise unavailable "Gotta Dance" that has driven the value of Zonk 1002 up to around $250. DEAR JERRY: I am trying to find the name and singer of an old beach music favorite. This female vocalist asks "whatda ya gonna do" and also mentions "Doctor Jekyll and Mister Hyde." DEAR BILL: With that first clue, you stopped immediately before getting to the title. It's the next three words: what are you gonna do "When I'm Gone." A little later she tells her soon-to-be ex, "you're a real Doctor Jekyll and Mister Hyde." The singer is Brenda Holloway, and "When I'm Gone" (Tamla 54111) became a Top 25 hit in April 1965. DEAR JERRY: One of my favorite 45s in the mid-'60s was "Cutest Little Thing," by Roy Clark. To me, it was as good as any teener song from that era. Recently, one of the online oldies channels played "Cutest Little Thing," but though their version was by Clark, it was a very different recording. I e-mailed them to find out more but got no reply. Maybe you can tell me how they came up with this alternative track. DEAR DONALD: Your letter evokes my personal fondness for teener tunes of the early '60s, many from the great Jerry Fuller ("Shy Away," "Guilty of Loving You," "First Love Never Dies," etc. ), and of course the Denny Reed hit that defines the genre, "A Teenager Feels It Too." Rightfully taking its place among the best is "Cutest Little Thing," by RAY Clark, not Roy. As an aside, I always felt this cute little thing would have been a perfect song for Rick Nelson. The reason what you heard on the radio didn't match the tune in your memory is because there are two separate recordings on two different records from two different companies, issued two years apart. The first "Cutest Little Thing" (D.W.A. 1001) came out in 1961, and runs about 1:53. The next release (Louis 6803), issued in 1963, shows a running time on the label as 2:05, when it really is only 1:45. It is instantly possible to know which version you're hearing, and it takes only one second. The first word cinches it. The 1961 issue (D.W.A.) begins with "Cutest little thing I've ever seen." The 1963 issue (Louis) begins with "You're about the cutest little thing I've ever seen." There are several other lyrical differences, plus the '61 track doesn't fade out quite as fast as the alternative take. IZ ZAT SO? Mention above of Rick Nelson brings to mind a nugget of music trivia that we have never mentioned in this column. During 1963, an amazing total of 17 different songs by Rick appeared on one or more of the national charts. Two things factoring into this unlikely happening are that seven of his 1963 singles were double-sided hits, making 14 right there. Also, beginning in March, both Rick's new label (Decca) and previous label (Imperial) had regular releases. Even with two labels fighting for a piece of the action, Nelson's 17 chart songs in one calendar year equals Elvis Presley's total for 1956. Actually, he compiled 17 hits in just 10 months, as his streak didn't begin until March — and they were all from one company, RCA Victor.